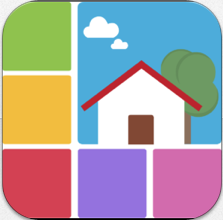 The brand new AAC app from Therapy Box, ChatAble has just been released on the App Store – (literally hours ago!) and we were lucky enough to get our hands on a copy to check it out. Therapy Box are well known for their quality AAC apps such as the text based Predictable, and Scene & Heard which focuses on the use of visual scene displays for communication rather than the traditional grid based displays, but their new app, ChatAble combines both grid and scene based communication for more flexibility and potential. My first impressions?? The app seems fairly intuitive to program, I was able to jump right in and start creating new pages with grids, visual scene displays and a combination of both – always a good sign and means you don’t have to spend too much time getting to know yet another app manual. But also good to know that the support features are there if you get stuck and need some help. I like the flexible input options such as using the grids, scenes, keyboard and handwriting – allowing for a wider variety of users, and to provide a system for today and tomorrow as the person’s skills change. Also great to have the access options for the same reasons. Want some more good news?? It is currently 50% off for a limited time – so now is the time to evaluate whether it could be the solution you have been looking for.